Actor Andrew Scott from Sherlock arrives on the red carpet for the IFTA Film and Drama Awards at the Mansion House in Dublin, Ireland on Sunday 24 May 2015. Photo credit: Barbara Lindberg. 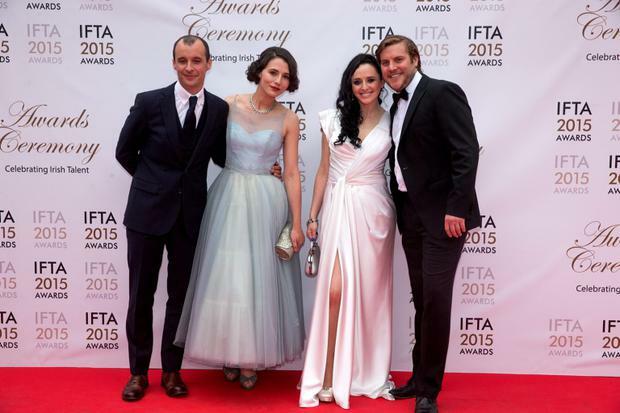 The Love/Hate crew scrubbed up nicely for the IFTA awards which were held at the Mansion House last night. It was quite the reunion for the stars who have moved on to other projects since the dramatic season five finale. Tom Vaughan Lawlor and John Connors had a sweet moment on the red carpet when Tom fixed his former co-star's bow tie. "It's really gorgeous actually seeing everyone. It'll be nice to see Aidan Gillen and the other guys too so it's great," Tom told the Herald. "It's a really important night and it's nerve-wracking just even turning up. I'm going to enjoy the night because it's the last Love/Hate for a lot of us." Charlie Murphy, who played Siobhan in RTE's top gangland drama, won the award for Lead Actress in a Drama, while Stuart Carolan was named Best Writer for a Drama. "It's really nice to meet everyone - it's going to be a brilliant night," he said. Star Mary Murray went all out for the event and had the title of the drama emblazoned on her neck in diamante. The show, which ruled the airwaves for five gritty seasons, also beat Game of Thrones, The Fall, Vikings and Charlie to take home the gong for Best Drama. Actress Sarah Greene, who wowed in a yellow dress by Helen Cody, picked up two awards for Best Actress in A Film for Noble (in which she played a young Christina Noble), as well as the Rising Star Award. "This means so much," she said. "I think I'm going to give these to my mam." The Cork actress will next appear in RTE 1916 drama Rebellion alongside Brian Gleeson and Charlie Murphy. Best Film went to Song of the Sea, while Lenny Abrahmson took the gong for Best Director for Frank, which stars Michael Fassbender and Domhnall Gleeson. Domhnall won Best Supporting Actor in a Film for his turn as an aspiring musician who joins an eclectic band led by a man wearing a giant fake head. Acclaimed film Patrick's Day took away three gongs last night. Moe Dunford won Best Lead Actor in a Film, director Terry McMahon won Best Film Script and it also took away the award for Best Sound. Deirdre O'Kane won Best Lead Actress in a film for her "labour of love" on Irish film, Noble. Game of Thrones star Aidan Gillen beat Jamie Dornan, Cillian Murphy and Tom Vaughan Lawlor to take home the award for Best Lead Actor in a Drama for playing Charlie Haughey in RTE drama Charlie. Meanwhile, The Fall's Aisling Franciosi won Best Supporting Actress in a Drama while Belfast native Stephen Rea won Best Supporting Actor in a Drama for his role in BBC2 drama The Honourable Woman. In the style stakes, Amy Huberman looked spectacular in a stunning Alex Perry dress from the Ivory Closet and revealed she is still working hard on the script for her movie, Bolt. "That's been the kind of focus now for the last six months: I've been writing and the second draft of the film has gone in and I feel like I have just finished the Leaving Cert, so that has been enjoyable but a learning curve as well because I haven't done it before," she said. The mum-of-two also gushed about how big her baby boy Billy has grown. "He's a real little boy now and he's great. He's a real little sweetheart," she said. "He's been around six months but I feel he has been around forever." Amanda Byram wowed in a gold and black feather creation from Umit Kutluk, while Miriam O'Callaghan went for a sparkling sequinned number from Cari's Closet, and host for the evening Caroline Morahan rocked a series of designer dresses from Armani, Roland Mouret and Louise Kennedy. Viking's star Alyssa Sutherland chose a pale pink Helen Cody number.